Colon inflammation induced by BF+ and BF– human colon mucosal tissue inocula in GF ApcMinΔ850/+;Il10–/– and ApcMinΔ850/+ mouse models. (A) Distal colon inflammation scoring (see Methods) for GF ApcMinΔ850/+;Il10–/– and ApcMinΔ850/+ mice inoculated with BF+ or BF– human colon mucosal tissues. Both panels show BF– human colonoscopy biopsies (BF-bx, n = 12 mice are shown). In the left panel, 3 BF+ groups (BF+bx, BF+NF, and BF+T) are combined into 1 group (BF+, n = 42 mice), and in the right panel, BF+ colon tumor (BF+T, n = 25 mice), BF+ normal flanking tissue from CRC patients (BF+NF, n = 8 mice), and BF+ colonoscopy biopsies from healthy subjects (BF+bx, n = 9 mice) are shown separately. Data displayed as mean ± SEM analyzed by Mann-Whitney U test. (B) Distal colon inflammation scoring analyzed by mouse genotype for GF ApcMinΔ850/+;Il10–/– and ApcMinΔ850/+ mice inoculated with BF+ or BF– human colon mucosal tissues. 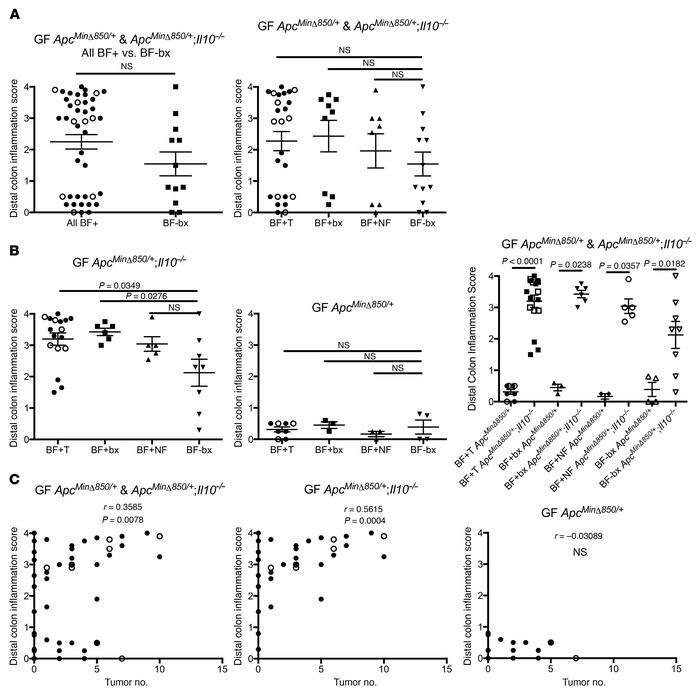 Distal colon inflammation is displayed for inoculated ApcMinΔ850/+;Il10–/– mice (left panel) and ApcMinΔ850/+ (middle panel) only and is compared across the ApcMinΔ850/+;Il10–/– and ApcMinΔ850/+ mice genotypes (right panel). Data are displayed as mean ± SEM and were analyzed by Mann-Whitney U test. For the left panel, P < 0.0167 was considered statistically significant using Bonferroni’s correction. (C) Analysis of correlation between distal colon inflammation score and tumor numbers in ApcMinΔ850/+;Il10–/– and ApcMinΔ850/+ mice inoculated with BF+ or BF– human colon mucosal tissues. Both mouse genotypes (left panel); ApcMinΔ850/+;Il10–/– mice only (middle panel); ApcMinΔ850/+ mice only (right panel). Colon tumor induction is increased in BF+ tissue types and correlates with distal colon inflammation only in ApcMinΔ850/+;Il10–/– mice (middle panel). Black circles represent mice analyzed at 12 weeks after inoculation. White circles represent mice harvested at 13–20 weeks after inoculation (n = 9 mice). Analyzed by Spearman’s rank order correlation.